Defenseman Brandon Burlon, the New Jersey Devils second-round selection in the 2008 NHL Entry Draft, will continue to develop his skills on the blue line next season at the University of Michigan. Just because Brandon Burlon played Junior A rather than major junior doesn't mean he has any less of a chance of making the NHL than any other player taken in the 2008 Entry Draft. Burlon played for the St. Michael's Buzzers of the Ontario Provincial Junior Hockey League, where he had seven goals and 24 points in 32 games last season. St. Michael's General Manager Richard Ricci acknowledges Burlon's speed, shot and vision are his assets, but knows that to make it in the NHL Burlon must get more physical and improve his decision making. "Brandon is a highly mobile defenseman with deceptive speed," Ricci said. "His strengths include a pro shot and the ability to get it off quickly, especially one-timers. He has good vision on the ice and plays a controlled and composed game. Areas of improvement and growth include his physical play and decision-making of when to join the rush. He battles hard, is a fierce competitor and is extremely good at running a power play." Burlon was selected in the second round (No. 52) by New Jersey. He was in attendance for the first round at Scotiabank Place, so it meant a little more waiting-around time in Ottawa than he was hoping for. "I was told either late first or early second, so I had to show up," Burlon told The Bergen Record. "A guy I played with last year, Brendan Smith, a lot of guys didn't think he was going to go in the first round and he did, to Detroit. So I showed up and sat through the whole thing and watched a lot of my buddies get drafted, but it didn't happen for me, so I went home and got some sleep. I came back with a smile on my face and ready to be drafted (on Day 2)." Burlon, who attended New Jersey's developmental camp in July, will play next season at the University of Michigan. NHL Central Scouting's Chris Edwards believes Burlon is going to help Michigan's power play, but also feels that like most young players, he needs to improve his defensive play. "He's not an overly big defenseman (6-foot, 190 pounds), but he has really good mobility and a good shot from the point," Edwards said. "He jumps up into the rush well, but needs to improve on his defensive reliability. He played in a really small rink this year and was still able to move the puck quickly and well. Puck-skill wise he's good, and as he moves up, his decision making will improve." Burlon thinks that he can stop the opposition's top forwards by utilizing solid positioning and speed. "If the coach tells me to shut down their top forward, I can do that," Burlon said. "My positioning, my defensive game is sound enough that I can play against a top guy. But if late in the second or in the third period we need some offense and to create some chances, I can do that, too." The Devils, whose defensemen scored just 26 goals last season, could use Burlon's offense from the back end, but New Jersey, which generally develops players slower than most teams, is going to let Burlon get seasoned at Michigan. 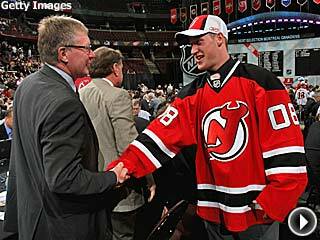 If he can make the Devils, though, he will have come a long way from the OPJHL.